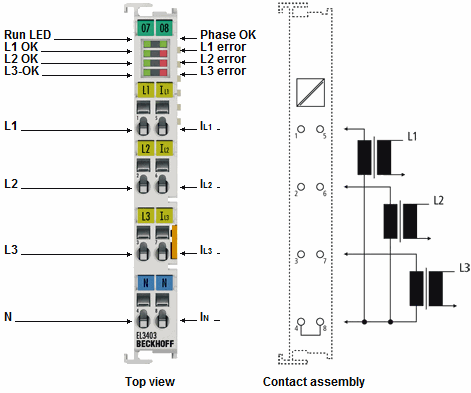 The EL3403 EtherCAT Terminal enables the measurement of all relevant electrical data of the supply network. The voltage is measured via the direct connection of L1, L2, L3 and N. The current of the three phases L1, L2 and L3 is fed via simple current transformers. All measured currents and voltages are available as root-mean-square values. In the EL3403 version, the effective power and the energy consumption for each phase are calculated. The root-mean-square value of voltage U, current I and the effective power P, apparent power S, reactive power Q, frequency F and phase shift angle cos φ can be derived. The EL3403 provides a comprehensive network analysis and an energy management option.